Monthly topics & pictures of the fun! Learn how to turn a jelly roll of 2.5 inch strips of precut fabric into 1,6000 inches of fabric for a quick and easy quilt top—in a day! Join us for our Annual Sewing Workshop from 10 a.m. to 4 p.m. Monday, May 20 at the Aboite Community Rom, 11321 Aboite Center Road, Fort Wayne. $25 for members and non-members - lunch by Mr. G's is included! Click here for complete information - plus how you can get a special discount from Edward's Sewing Center if you buy your jelly roll there. Do you love to sew? We do, too! Join us as we explore all things sewing - garment making, home dec, quilting, serger, felting, sewing tips and tricks, community service projects and more. You will find fellowship, inspiration, discounts, free online videos and just plan fun with others who share the same passion for sewing. 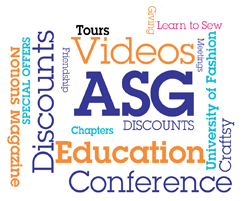 The American Sewing Guild welcomes sewers of all skill levels, ages, and interests. We offer a place for sewers to learn new skills, share interests, and contribute through community service. Membership offers the opportunity to nurture your love of sewing in a supportive and caring community of others who share your love of all things sewing. Please take a stroll through our website to find out more about us. Then open the door to a new world of sewing friends, learning and just plan fun with people just like you. Simply fill out our contact page and press send. We will look forward to getting back with you!